Create a one-of-a-kind look with “Architectural Millwork.” Architectural millwork consists of traditional casing, base, and crown mouldings, but also includes specialty millwork such as curved millwork, specialty columns and pilasters, fireplace mantels, pediment heads for doors and entryways, raised panel wall systems, and much more. These items are highly custom, and are typically designed specifically for your project’s application. 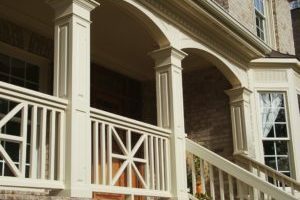 Tree Court Builders Supply can craft your wood columns in many designs including authentic classical designs from antiquity, contemporary, craftsman or from your own custom design. Wood columns are available in round or square styles with tapered or non-tapered shafts in a smooth or fluted shaft design. If you can’t find exactly what you are looking for, we can create a custom product or customize one of our products to better suit your needs. Tree Court is also a premier supplier of HB&G’s PermaCast® – fiberglass columns, posts, railing, and balustrades and PermaLite square columns, a low-cost, load bearing, weather and insect proof, low-maintenance alternative. A stairway is often the main focal point when visitors enter your home. 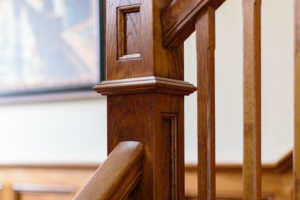 Design choices, such as: specie selection, stain or paint, or whether to use wood or iron balusters, will ultimately determine the statement your stair makes. Whether you are looking for the simple lines of Koetter’s arts & crafts styling or the old-world charm of iron, Tree Court offers a broad array of styles and species that adapt to any décor. Tree Court Builders Supply offers an extensive selection of windows, exterior and interior doors, hardware and moulding as well as specialty millwork. We also have the ability to make many custom items in our Tree Court shop. We are extremely proud of the many one-of-a-kind projects we have created for our customers – customers who trusted their design vision with us and we delivered. 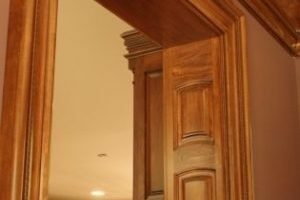 From customized doors, curved millwork, unique columns, stair parts, fire place mantels, to ceiling treatments and raised panel wall systems – Tree Court provides exceptional work at affordable prices and unparalleled customer service. Whether in a media room, in a library, in a kitchen, in a bedroom, entry way or family living space – anywhere your project designs call for custom windows, doors, architectural or specialty millwork products, Tree Court Builders Supply is here to serve your needs. Our master craftspeople work hard to ensure high-quality, precision-made products for residential and light-commercial applications and would love to create something unique for you. Need help with design ideas? Visit our Idea Center to view an assortment of windows, doors, specialty and millwork applications or contact one of our knowledgeable customer sales representatives to help you walk through the design process. We look forward to hearing from you!